When I signed up for the Australian Women Writers challenge, I opted for “Franklin-fantastic” level: read 10 books and review four. My reading selections weighed heavily in favour of literary works and crime, so I’m more of a “Dabbler” than an “Devoted Eclectic”, despite the name of this review blog, but I did manage to include some other genres, including historical fiction/romance, children’s fiction and contemporary women’s fiction. The first three books are ones I discussed in depth. With Eva Hornung’s Dog Boy, I gave a personal response, rather than a review. The remainder are books I either wrote a (sometimes very brief) review on Good Reads, or didn’t review. For this challenge I went out of my comfort zone. Apart from readings books by friends, it’s years since I read literary fiction, children’s stories, historical romance or contemporary women’s fiction. My preferred genre is psychological suspense. What surprised me was how much I enjoyed the books for which I’m clearly not the target audience. I could easily become a fan of Lisa Heidke, for example, and I’d like to read some adult fantasy by Tansy Rayner Roberts. One book I was very excited to discover and which has remained with me was PM Newton’s debut novel, The Old School, which blends literary fiction and crime. But the stand out for me was Eva Hornung’s Dog Boy. I’ll let my review/discussion reveal why. Eva Hornung’s Dog Boy and the challenge to moral thinking; or Towards a Systems’ Theory view of Subjectivity. AWW’s 1000+ reviews: Where to from here? All your hard work with AWW challenge is appreciate, Elizabeth. Enjoy your writing time – you deserve it! Thanks, Helene. It won’t stop me reading, but it’s great to have reached the 10-book milestone. Great reference. Best wishes for your own writing! Well done, Elizabeth! You’ve put so much energy into the AWW challenge, with the organising as well as reading and reviewing. I saw you got a mention in Saturday’s Herald! Good luck with your writing. Well done completing the challenge Elizabeth! You’ve been tireless working hard to promote it everywhere and I hope you enjoy taking some time to spend on your own writing. Best of luck with that! Thanks, Bree. I’m looking forward to getting back into my own story world – even though I still have lots of AWW books I still want to read. It’s great to have them tucked away, waiting for another break. One thing I’ve noticed after reading so many wonderful writers is that I have a long way to go with my own writing! They set a fantastic example. Exactly, even if parts of it were tough. And re the challenge, you’re very welcome, Lisa. It’s been wonderful to find so many talented new authors. Thanks, Ann-Marie. I’ll continue throughout the year, too, when I need a break from my own writing. But it’s great to have reached that 10-book goal. Lots of love from Katoomba! Congrats. I’m 7 books read and 7 reviewed but have a big pile of review copies to read and they are slanted in favour of male authors. I will keep going for the rest of the year as its been a rewarding challenge anyway. I made the commitment last year to try and get as close to a 50:50 gender split in my reviewing last year > ended up with 40: 60. Thanks, Sean. It’ll be interesting to see how the gender balance pans out for you this year. I saw your post on speaking as a feminist. It’s so tricky, isn’t it? Thanks for being one of the few male readers/reviewers to join in the challenge. Your own contribution is much appreciated. I am still yet to run across that poorer quality fiction that certain people say might creep in when you implement quotas :). All the women I have read this year have been top flight. There’s so much talent to draw on, isn’t there? And I’m sure the wonderful books still to read far outnumber the ones I’ve read so far. That’s great, Christine. I’m so glad you’re enjoying the challenge. I knew nothing about Good Reads before creqting the challenge and it’s been great to see so many books reviewed there. I’m still coming across names of Aussie authors I’ve never heard of (just today on Twitter I learned of two new ones). I hope the challenge has some positive impact on the problem of gender bias. At the very least, by the end of the year, I think quite a few of us will know our authors a whole lot better than we do now. Congratulations on finishing the challenge so soon Elizabeth! I’m really enjoying this challenge, it’s been lovely to discover new Aussie talent and share thoughts on books by local authors. Thanks, Jayne. I’ve really been enjoying it, too. And I’ve met a few authors along the way as well. You haven’t seen the last of me, by the way, but it’s great to achieve a milestone and take time out for my own writing. I’ll also try to get round to read a few more reviews. Well done Elizabeth. I was astonished to see how many had completed the challenge. I’ve now read 4 of my planned 10, in 3 “genres”, but it will be a little while before I complete it. I do have all year, right!!? Anyhow, thanks for getting this going. This is the first challenge I’ve taken part in in nearly three years of blogging. Challenges aren’t my thing – except this one of course! Thanks, Sue. I’m very glad you’ve joined in. Yes, the challenge goes all year, so there’s plenty of time to post reviews. Some people had time off work in January and devoted themselves to the task. Others are just amazingly quick readers. Some (like me) wanted to complete in order to refocus on other commitments – like writing – but I doubt any of those who have finished will stop at ten! I have finished the challenge but like you I am continuing to read Australian Women authors – was blown away how many there actually are. Isn’t it amazing, Sally? I’m still coming across amazing, prize-winning authors. I could read for years and still not get through them all. I’m glad you’ll be continuing to read AWW – and please feel free to keep adding your reviews to the challenge page. 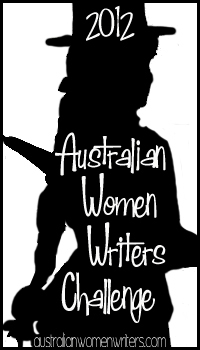 I’m so thrilled that this challenge is introducing people to the wealth of Australian women writers. It’s astonishing what breadth and depth we have — women have played a significant role in the development of Aussie lit. Just think Miles Franklin at the turn of the century and her impact AND then in the 1920s and 30s women played leading roles in the development of the Fellowship of Australian writers and in negotiating with government to provide support for literature and writers. This is a wonderful initiative Elizabeth.